lions, leopards and hyenas can then get through the barrier to the livestock. And when big cats kill their cattle, the Maasai generally kill the cats. These killings in retaliation, together with loss of habitat and lack of prey, are causing a dramatic reduction in the number of big cats in Africa. Especially the population of African lions has dropped: from 76,000 in the 1980s to only 35,000 now. Nature conservationists and Maasai herders have come up with a solution: a reinforced boma, in the form of a ‘living wall’. Small trees are planted beyond an inner ring of acacia thorns. These trees serve as posts for a chain-link fence which the predators cannot penetrate. Results were examined from living walls placed from 2003 to 2013 in Tarangire National Park. 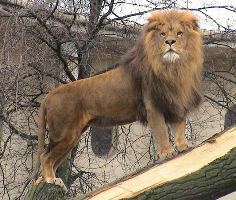 The living walls are very effective: though they still share the same habitat, lions and other predators cannot get through, and the Maasai are no longer killing cats in retaliation. Good communication between conservationists and the Maasai has proven crucial. Maasai living on the Serengeti and in other parts of Tanzania have also shown interest. The team placing the fences can barely keep up with orders. Monitoring in the region has continued to keep tabs on the prey available for lions, as the team only dares place fences where there are enough zebras, antelopes and gnus.